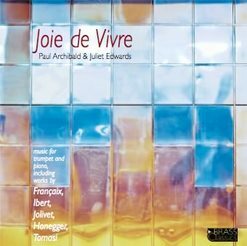 Alongside popular works such as Ravel�s Habenera, Honegger�s Intrada, the Fran�aix Sonatine and the Hubeau Sonate, are featured lesser-known gems by Jolivet, Ibert and Damase, and works by their contemporaries Pierre Gabaye, Marcel Bitsch, Paul Bonneau and Henri Tomasi. Paul and Juliet collaborate on a variety of projects. Juliet has performed concertos for piano and brass, most recently Meld by Nicholas Sackman, conducted by Paul. Each year they perform and coach as part of the Aberystwyth International Musicfest and the Dartington International Summer School.They are also founders and Artistic Advisors to the Brass Classics label and Juliet is a producer for the label.The duo gives frequent performances of repertoire for trumpet and piano, and is committed to performing contemporary works and commissioning new pieces for this combination.They have worked with leading composers such as Sir Peter Maxwell Davies, whose virtuosic Trumpet Sonata they have recorded for the composer�s own MaxOpus label.